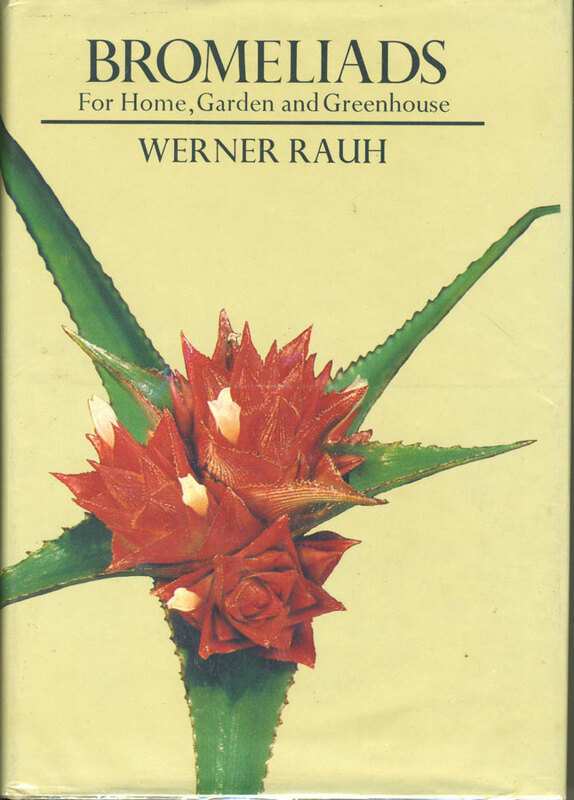 Bromeliads: For Home, Garden and Greenshouse by Werner Rauh. English edition edited by Peter Temple, and published in 1979 by Blandford Press, England. (The original German edition was published in two volumes in 1970 and 1973). As it is now "out of print", you will only be able to buy a second-hand copy. The book has 431 pages of text, 134 colour photographs, 315 black and white photographs, and 90 line drawings (illustrations). It is presented in two Parts. The first Part commences with a brief description of several South American trips undertaken by Dr. Rauh, and his companions, while collecting bromeliads. While interesting as a travelogue, it also highlights the great diversity of habitats occupied by bromeliads. Bromeliads', particularly tillandsias, growth habits are then described. The description is presented in largely non-technical terms and is one of the clearest, published presentations on this topic. A section on growing bromeliads, basically under European conditions, concludes Part 1. However, while containing some useful insights, the applicability of this section to Queensland is limited, given the climatic differences between Queensland and Europe. In the book's second Part, information is presented, in a summarised form, on the appearance (including inflorescence), natural habitat, and other relevant comments (for example, specialised cultural requirements) of nearly 450 bromeliads. There are 176 Tillandsia species' descriptions, 22 Guzmania, 39 Vriesea, 15 Billbergia, 19 Neoregelia, 13 Pitcairnia, 14 Puya and about 150 species from other bromeliad genera. Some species, and genera, names have changed since the book was published. However, it would not be a difficult task to ascertain current names by asking some of the Society's experienced growers. Botanical terms are used to describe the plants' appearance. However, the terms are used in a manner which is relatively easy to follow, if you have access to a dictionary of botanical terms. The first Part of this book is likely to be of interest to most readers. The second Part is probably of most interest to Tillandsia and grey-leaved Vriesea growers who are interested in gaining a good knowledge of the appearance, and natural habitat, of most of the species available in Queensland.